Bacteria have been genetically engineered to digest a fluorine compound and turn it into a new type of bioplastic. 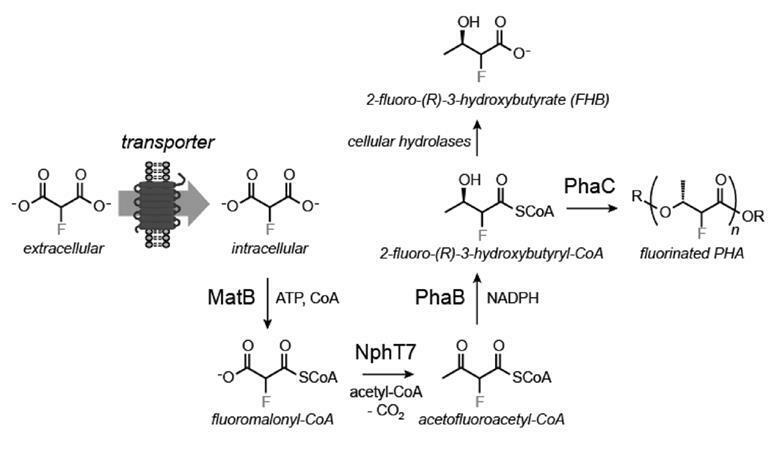 This is the first biosynthesis of a fluoropolymer and it could pave the way to making organofluorine synthesis greener. Although fluorine has found its way into many synthetic compounds, such as the antidepressant Prozac and the non-stick material Teflon, the most electronegative element in existence is rarely found in nature. ‘Fluorine lacks bioavailability,’ explains biomolecular scientist Cormac Murphy from University College Dublin, Ireland, who wasn’t involved in the new research. ‘There’s a lot of fluorine in the Earth’s crust, it’s the 13th most abundant element, but most of the it is locked up in rocks.’ Only a few organisms have evolved to metabolise inorganic fluorides, and a natural source of elemental fluorine was only recently discovered. Michelle Chang from the University of California, Berkeley, US, and her team have now engineered a common bacterium, Escherichia coli, to turn fluoromalonate into a biodegradable polymer. The researchers inserted genes from different organisms into E. coli to encode enzymes that can process fluorine-containing substances. However, when fed on fluoromalonate, the cells initially refused to turn out any fluorinated compounds. Chang and her colleagues discovered that the E. coli can’t absorb the feedstock and had to add a specialised carrier protein to the bacterium. ‘I think the real breakthrough in this paper is the transporter and identifying that [fluoromalonate] uptake was the initial problem,’ comments organofluorine chemist David O’Hagan from the University of St Andrews, UK. With the transporter in place, E. coli turns about 50% of the fluoromalonate into 2-fluoro-3-hydroxybutyrate, which it then polymerises. The resulting polyester contains up to 15% fluorinated units. The fluoropolymer turned out to be less brittle than the non-fluorinated version, a commercial bioplastic, something that surprised Chang. Although fluoromalonate is cheap, Chang thinks it might be possible to engineer an organism that makes fluoropolymers directly from inorganic fluorides. ‘The question is if it’s cost-effective,’ she says. O’Hagan says that ‘fermentation would take care of the kinetics’, adding that if ‘you were doing this chemically over eleven steps, you would need a lot of reagents, solvents, metal catalysts’.